In remembrance of a dark centennial, those opening days of the Great War, the University of Houston Special Collections is proud to offer “1914-2014: Commemorating One Hundred Years — World War I,” a small exhibition of materials held by Special Collections relating to World War I and curated by our own Pat Bozeman, Head of Special Collections. On November 11, 1918 Germany and the Allies of World War I met in a rail carriage in Compiègne and agreed to a cease fire to take effect on “the eleventh hour of the eleventh day of the eleventh month,” ending major hostilities of the world’s first, great war. It had begun a little over four years prior, in the summer of 1914, and promised a quick and decisive shift in the fault lines of Europe. Instead, this four year meat grinder would cast a long shadow that rewrote our maps, crumbled our empires, redefined our relationships with one another, and, far from teaching humanity a final and humbling lesson, it ushered in the great and awful maw of man that would be warfare in this new century and our next millennium. However, for just a brief window beginning that autumn morning in November of 1918, the world was allowed to collectively sigh and reach for rest. Armistice Day, a day celebrating that longing for calm and peace in the aftermath of war, was born. As you remember those lost and celebrate the peace they helped bring, we invite you to view this exhibit of original materials produced among the storm and in its wake. “1914-2014: Commemorating One Hundred Years — World War I” is available for viewing on the first floor of the M.D. Anderson Library at the foot of the Morrie & Rolaine Abramson Grand Staircase. 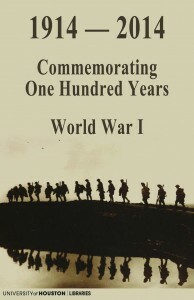 Highlights include writings from George Bernard Shaw (who saw the wasted lives of youth suffering through the death throes of empires and for capital’s immorality), Rudyard Kipling’s France at War (“They come and fill the trenches and they die… They send more and those die.”), and remarkable examples of WWI propaganda. If reflections on today have you interested in researching more, remember that in addition to the rare works highlighted above, UH Special Collections is also proud to offer the USS Houston & Military History Collections for study in our Reading Room during normal hours or you can review our Military History Collections via our Digital Library, 24/7, 365 days a year. In addition to the over 7,000 linear feet of archival collections made available for study at the University of Houston Special Collections, we are also proud to offer over 100,000 rare and antique books for use in our reading room. 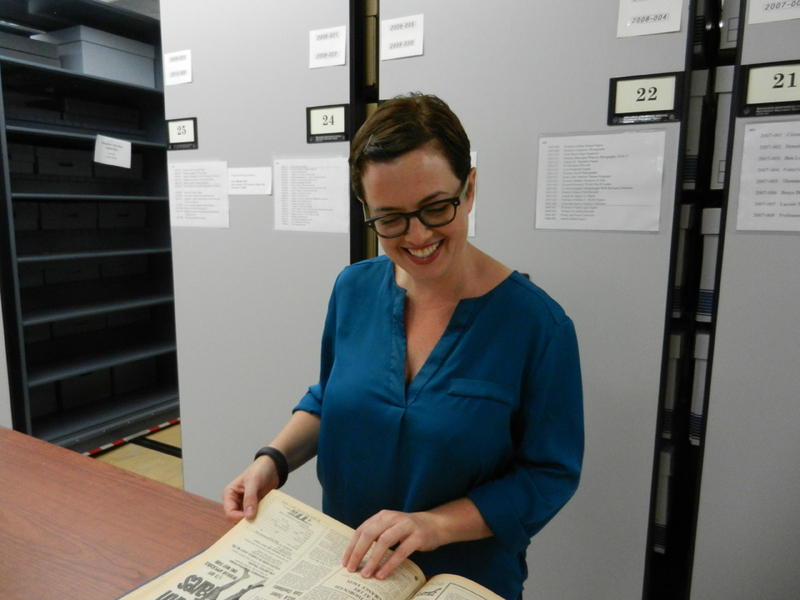 Each month we will highlight a text from our collections and what makes it so special. This month, Matt Richardson shares John Dos Passos’ Nineteen Nineteen from the U.S.A. trilogy. John Dos Passos’ U.S.A. is a sprawling look at American life in the early 20th century that takes place across 3 novels, several decades, and over 1000 pages. Consisting of the novels The 42nd Parallel (1930), Nineteen Nineteen (1932), and The Big Money (1936), it was first published as single volume in 1938 by Harcourt Brace. In addition to the rather straightforward narrative passages, Dos Passos’ work incorporates collections of headlines and popular songs in “Newsreel” segments, impressionistic renderings called the “Camera Eye,” and short biographies, often satiric, of prominent Americans. Beyond the complexity and innovation of the form itself, the element that typically garners the most critical attention is the cinematic stream of consciousness Camera Eye, which often elicits comparisons to Joyce. Though the novels purport to be the epic of one nation, Dos Passos’ U.S.A. inevitably overflows those boundaries, as it is filled with characters who frequently journey abroad and are continually shaped by their imaginings of and interactions with the wider world. This perspective is especially apparent in the middle novel of the trilogy, Nineteen Nineteen, which focuses on the trying years of World War I and the unsettled peace that followed it. UH Libraries’ Special Collections has the distinct pleasure of holding a 1946 printing of Nineteen Nineteen signed by Dos Passos himself. Interestingly, the inscription reads: “To Adrienne Rich cordially John Dos Passos”. 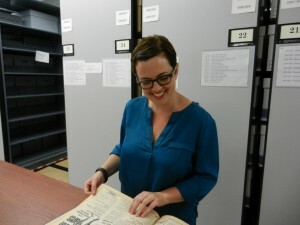 How the author might have encountered the American poet, essayist, and feminist, or for that matter how the University of Houston Libraries Special Collections later came into possession of her copy, would no doubt make for an interesting tale in its own right. (Though it’s not her only appearance in our collections). And since this 1946 printing was originally issued as a box set by Houghton Mifflin, one wonders what became of its companion copies of The 42nd Parallel and The Big Money. 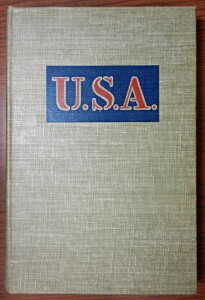 Bound in rather austere tan buckram with a stencil-style “U.S.A.” stamped across a small blue field, the exterior of the book almost evokes a government provision of the type Dos Passos’ enlisted men might receive. 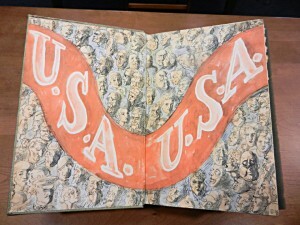 In contrast, the interior includes vivid end-sheets and illustrations by Reginald Marsh. And should the 1000+ page epic constitute more time than you can devote to our reading room, fear not! 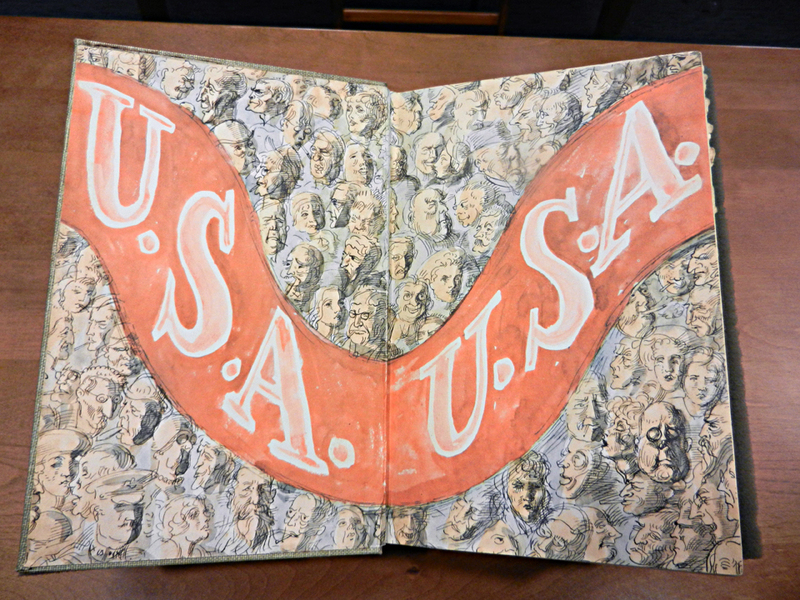 After you’ve taken a look at our signed copy here in Special Collections, you’ll be pleased to find circulating copies of the U.S.A. trilogy in the general collections stacks of the M.D. Anderson Library. A week’s worth of activities and festivities will be capped off this weekend with Saturday’s football game against the Tulane University Green Wave. In honor of this special week, the University of Houston Special Collections is proud to present “UH Homecoming Through the Years,” an online exhibition curated by our own Matt Richardson and Sara Craig that traces the history of the tradition back to its origins in 1946. Featuring visual histories of the Homecoming Court, Homecoming Game, and festivities that have traditionally centered around Homecoming Week down on Cullen Boulevard, “UH Homecoming Through the Years” pulls from a number of collections in our University Archives and related items. 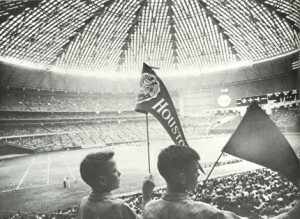 Daily Cougars and Houstonian yearbooks showcase some significant Homecoming Queen history, the UH Photographs Collection provides remarkable views of our traditions over time, and the Athletic Department Records remind us of some great homecoming victories that signified UH’s rise as an athletic as well as academic power. As the celebrations of the week call all Cougars back home, be sure to spend some time with a virtual stroll through college days gone by with our newest online exhibit and be sure to visit Special Collections for a closer look at the University Archives.